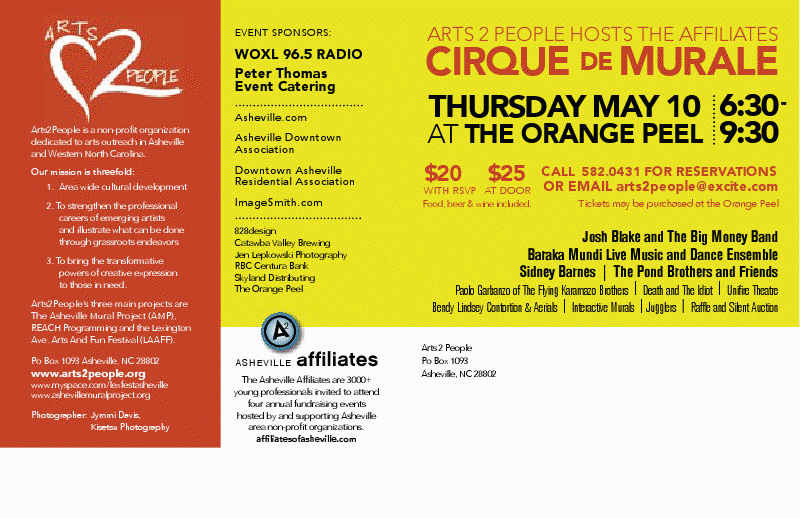 The Asheville Affiliates will host Arts2People Thursday, May 10 from 6:30 p.m. to 9:30 p.m. at The Orange Peel. Monies raised will support the projects of Arts2People; a non-profit organization dedicated to arts outreach in Asheville and Western North Carolina with a threefold mission: 1.) Area wide cultural development 2.) To strengthen the professional careers of emerging artists and illustrate what can be done through grassroots endeavors 3.) To bring the transformative powers of creative expression to those in need. A2P puts on the Lexington Avenue Arts and Fun Festival (LAAFF), provides REACH programming for underserved populations (Responsive Education Accessing Creativity for Healing), and coordinates the Asheville Mural Project (AMP). A portion of dollars raised at this event will go towards funding AMP’s newest venture, the Lexington Gateway Mural, which is to be painted on the support columns upholding the I-240 overpass at Lexington and Broadway, the North corridor entrance into the central business district. It is a huge undertaking and A2P is so thankful to the city for their support in the Mural which will celebrate the people, culture and heritage of Western North Carolina. For photos of sketches of the mural and more information please visit www.ashevillemuralproject.org. Tickets are $20 with RSVP or in advance at The Orange Peel or $25 at the door. One may RSVP by e-mailing arts2people@excite.com or calling (828)582-0431. Raffle tickets will also be available at the event. If A2P raises $10,000 by the end of May a local woman is offering a matching grant. Reserve your tickets today! Event sponsors include: ImageSmith.com, Asheville.com, Peter Thomas Event Catering, Asheville Downtown Association, Classic Hits 96.5 WOXL, DARN (Downtown Asheville Residential Neighbors), 828: design, Catawba Valley Brewing Company, Jen Lepkowski Photography, RBC Bank, Skyland Distributing, The Orange Peel, topfloor.studio, Greenlife Grocery and the Asheville Mural Project. The Asheville Affiliates are 3,000+ young professionals invited to attend four annual fundraising events hosted by and supporting Asheville area non-profit organizations. Events are absolutely open to the general public. For more information about these exciting community events or for sponsorship and volunteer information, contact Jody Whitehurst at ashevilleaffiliates@yahoo.com, or visit the Asheville Affiliates Web site at www.affiliatesofasheville.com.